.Rex Tillerson listens to a question during a media conference at the Presidential Villa in Abuja, Nigeria. VietPress USA (Mar. 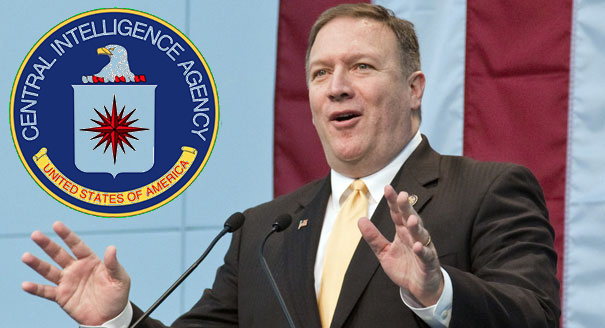 13, 2018): Today President Donald Trump official announced to fire Rex Tillerson from his position of 69th United States Secretary of State and replace him with Mike Pompeo, Director of CIA. 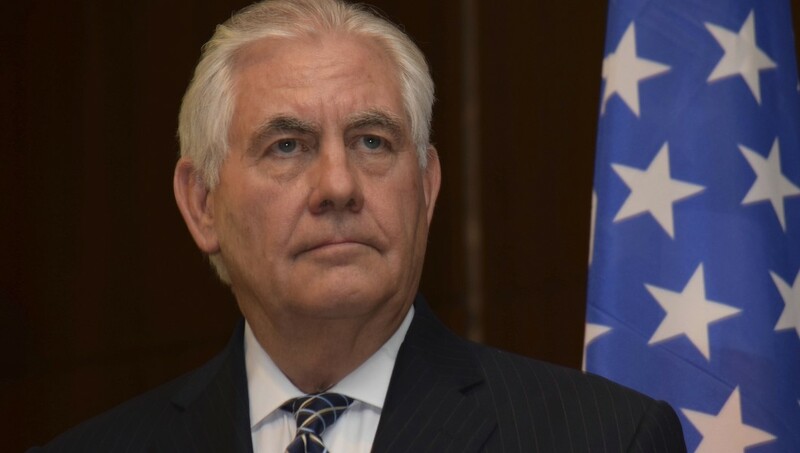 Rex Wayne Tillerson (born March 23, 1952) is an American diplomat and civil engineer, former energy executive, and government official serving as the 69th United States Secretary of State from February 1, 2017 under President Donald Trump. Originally a civil engineer, Tillerson joined Exxon in 1975. He rose to become chairman and chief executive of ExxonMobil from 2006 until 2017, when he left to join the Trump Administration. Tillerson began his career as a civil engineer and holds a bachelor's degree in civil engineering from the University of Texas at Austin. By 1989 he had become general manager of the Exxon USA central production division. In 1995 he became president of Exxon Yemen Inc. and Esso Exploration and Production Khorat Inc. In 2006 Tillerson was elected chair and chief executive officer of Exxon, the world's sixth largest company by revenue. Tillerson retired from Exxon effective January 1, 2017. He is a member of the National Academy of Engineering. On March 13, 2018, Trump fired Tillerson and said he would nominate Mike Pompeo to succeed him as Secretary of State. Trump announced via Twitter that Pompeo will do "a fantastic job," and that Gina Haspel will become the new CIA director. “I look forward to guiding the world’s finest diplomatic corps in formulating and executing the president’s foreign policy,” Pompeo said Tuesday in a statement released by the White House. The Washington Post reported Tuesday that Trump asked Tillerson to step aside on Friday, but other reports say the secretary of state learned the news over Twitter. Tillerson thus cut his trip to Africa short to return to Washington. However, State Department spokesman Steve Goldstein said in a statement that Tillerson "did not speak to the President (prior to his firing) and is unaware of the reason." "The Secretary had every intention of staying because of the critical progress made in national security. He will miss his colleagues at the Department of State and the foreign ministers he has worked with throughout the world," Goldstein said. Multiple lawmakers also said they learned of Tillerson's departure from Twitter or news reports Tuesday morning. Pompeo will have to be nominated and approved by the Senate before he can take Tillerson's spot in the government. Republicans can approve anyone they want in the Senate as long as they stick together, and Pompeo was confirmed for his current post in a 66-32 vote. “His experience in the military, Congress, and as leader of the CIA have prepared him well for his new role and I urge his swift confirmation,” Trump said in a statement Tuesday, as he wished Tillerson and his family well. Vice President Mike Pence backed Trump and urged the Senate to confirm Pompeo, "a man of highest integrity with unquestionable qualifications who will do an outstanding job." 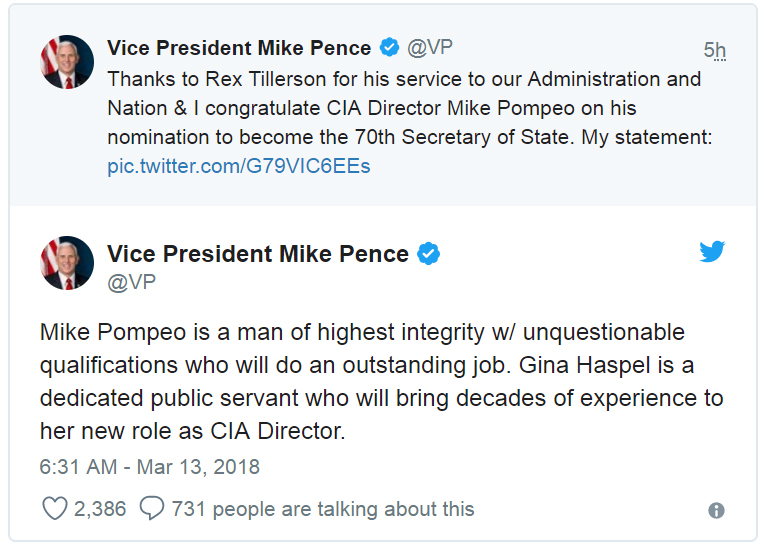 Pence also said Pompeo and Haspel "will continue to serve our nation with distinction" following their confirmation. Tillerson's ouster ends a tumultuous year for him in Foggy Bottom, where an ambitious plan to redesign the State Department never reached fruition and where the top U.S. diplomat often found himself at odds with Trump's foreign policy instincts. In July, a visibly uncomfortable Tillerson was forced to hold a press conference to defend his boss after he was accused of calling Trump a "moron" during a Pentagon meeting earlier last spring. He never explicitly denied using the derogatory name to describe the president, but the State Department press spokeswoman did. In October, the president publicly chided Tillerson for "wasting his time" by pursuing diplomatic talks with North Korea. But earlier this week, Trump agreed to meet with country's leader Kim Jong Un by May. Last fall, Trump challenged Tillerson to an IQ test, and suggested he would score higher than his secretary of state. A senior White House official said the decision to fire Tillerson came as Trump “wanted to make sure to have his new team in place in advance of the upcoming talks with North Korea and various trade negotiations.” Tillerson privately warned Trump earlier this month that increased steel and aluminum tariffs, which the president imposed last week, could harm certain alliances. In addition to his strained relationship with the president, Tillerson regularly clashed with Trump's son-in-law Jared Kushner. Multiple outlets regularly reported on the secretary of state privately complaining to staff and Defense Secretary Jim Mattis about Kushner's foreign policy portfolio, and accused him of complicating diplomatic negotiations and creating issues for the administration. Just hours before his exit, Tillerson declined to say whether Kushner had foiled diplomatic talks in the Middle East. Tillerson came close to leaving Washington last fall, NBC News reported at the time, but later told a friend he intended to remain in his Cabinet position until the end of the year.